I feel very lucky that I have the opportunity to monitor Little Owl nests. Each year, it is a privilege to be able to watch these beautiful, hard working owls lay their eggs and raise their young. 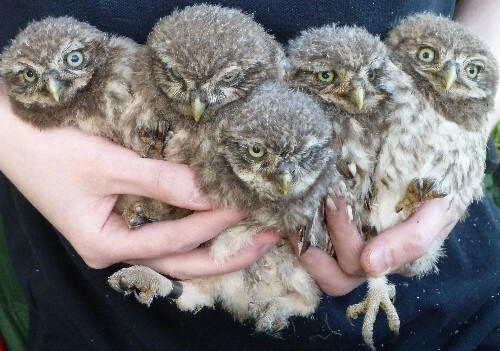 Little Owl chicks grow at a remarkable rate, from 10 to 160 grams in 28 days. This is only possible with round-the-clock care from both parents. I'm installing a camera in a nest box in the hope that I can record footage of a UK Little Owl breeding attempt to share with you. The selected Little Owl nest box is located in a small rural village in the Wylye Valley in Wiltshire, England. It is sited in a mature Ash tree in the corner of a field, close to working farm buildings. It is box number 2 in Major (Rtd) Nigel Lewis’s extensive raptor nest box project. Nigel first installed a Little Owl nest box in this tree in 1994; we replaced the original box with a modified ex ammunition box in 2009. It has more room inside and a ledge around the box to prevent the juveniles from leaving home before they are four weeks old. It is a beautiful farm and the landowner works really hard to manage it for nature. Paddocks are rotationally grazed by horses and sheep. There are two mature tree lines at right angles to the nest box tree; these are interspersed with Hawthorn and Elder. There is a wooden fence one metre from the Ash tree; I have seen a Pied Flycatcher sitting on this fence in late May. Buzzards nest three trees away. Four species of owl have been recorded here; Barn Owl, Little Owl, Short-Eared Owl and Tawny Owl. In 2014, a Little Owl pair raised five chicks in this box! Little Owls have used this box as a breeding site for 21 years. For the past two years, Stock Doves have bred in this box in July after the Little Owls finished breeding. There are two other Little Owl nest sites nearby; the first is under the roof tiles of a small church 250 metres north east and the second is an old Ash pollard 500 metres north, on a farm at the opposite side of this village. It is a wonderful place to take a stroll on a still early summer evening. I recently heard a Little Owl pair calling here and am hopeful that they will use this box for breeding in 2015. Little Owls usually start to lay their eggs in mid-April. 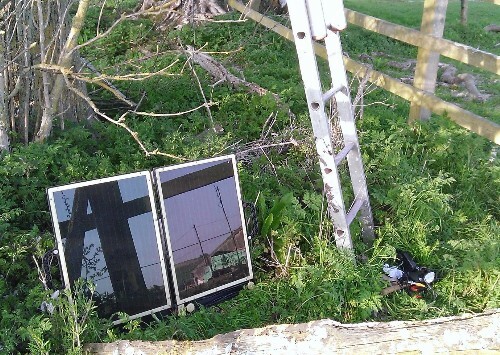 On Thursday 16th April, I installed a small infra-red camera inside this nest box. Before I installed the camera, I carefully checked inside the box to see if it was occupied. No one was in the box. I connected a cable from the camera to a digital video recorder (DVR) at the bottom of the tree. This means that I can download video files without having to disturb Little Owls, should they breed here. The system is powered by a small car battery, which is trickle charged by a solar panel. The DVR records footage onto a memory card each time motion is detected inside the box. I have to change the spent battery with a fully charged battery every 48 hours. If Little Owls do use this box for breeding, they should start egg laying within the next week. Check back for the latest news. You can learn more about the Little Owl’s breeding cycle here.